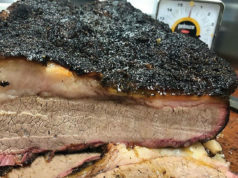 The SoCal chain’s newest outpost in Southlake provided a meaty homecoming for our critic. 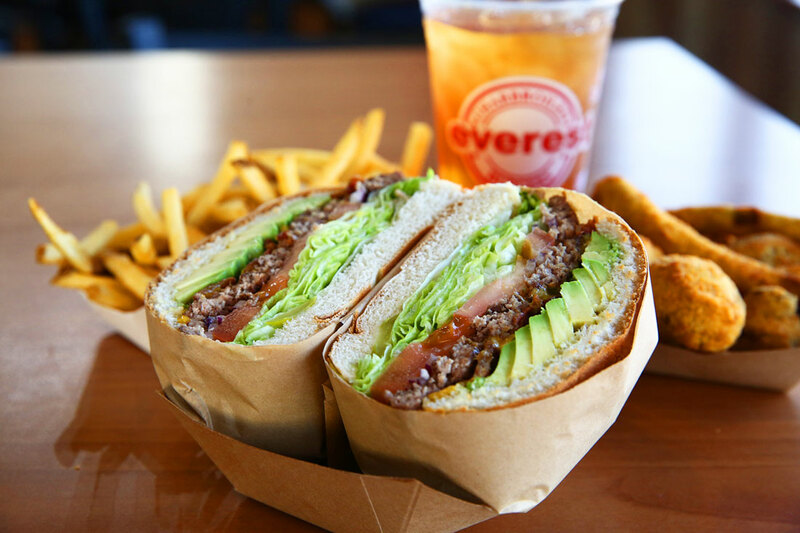 Everest Burgers’ avocado bacon cheeseburger delivered “an avalanche of open-flame flavor.” Photo by Velton Hayworth. 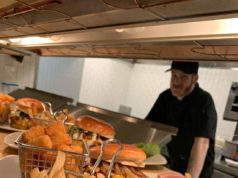 Everest Burgers, 2325 S Southlake Blvd, Southlake. 682-223-2333. 7am-10pm Sun-Sat. All major credit cards accepted. My tiny taxi clunked to a stop by an unlit entryway. Where the hell was I? The driver motioned for me to get out, pointing vaguely in the direction of the dark expanse. I walked slowly into the void, thankful that I brought my headlamp as I stepped over stacks of rebar and construction debris. Stray dogs scampered about while fires flickered in the distance. Somewhere, a baby was crying. This can’t be right. Peering into the blackness, my eyes began to focus on a dim light that illuminated a small group of people. They were lining up in front of a large rectangular frame — a metal detector. Aha! I was in the right place: the domestic airport terminal in Kathmandu, where I would catch an early-morning sightseeing flight to Mount Everest. I’d been traveling and trekking through Nepal for almost a month with nary a cheeseburger in sight. Water buffalo burgers with yak cheese are as close as it gets. Most Nepalese are Hindus, who consider cows a sacred animal, and almost all the rest are vegetarian Buddhists. My beef cravings had reached a peak by the time I arrived in Dubai on my trip home. Everest Burgers arrived here not from the Himalayas but from the fuzzy green foothills of the San Gabriel Mountains, just north of Los Angeles. 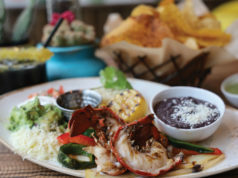 Southlake is the first Texas location for the family-owned restaurant. The buzzed-about fast food joint hails from a long tradition of SoCal drive-thrus. With pastrami sandwiches, gyros, and Mexican food, its ample menu reflects LA’s rich ethnic diversity. You’ll also find salads, sandwiches, and plenty for breakfast, but charbroiled burgers are the star attraction — and by far the best thing on the menu. Everest’s 100-percent ground-beef burgers deliver an avalanche of open-flame flavor that brings to mind backyard cookouts and happy times. I added avocado to my cheeseburger in a nod to the Avocado State and threw down a little bacon in a nod to everything good in life. Classic burger elements backed up the patty’s rich smokiness: lettuce, tomato, onion, and a pickle. Yellow mustard and a Thousand Island-style “secret sauce” completed the package. The cheeseburger was an unabashed mess to eat, despite being wrapped in paper and cut in half. And it was totally worth the new stain on my shirt. Everest Burgers breads their onion rings and fried zucchini every day, and they did not disappoint. Cut to an easy-eating size and dipped in housemade ranch, they disappeared quickly. A saltshaker filled with a mysterious seasoning mix supplied the missing saltiness, “salt and pepper and something else,” according to a staffer. Chicken taquitos arrived under a mound of shredded cheese. Served with fresh guacamole and stuffed with high-quality meat, they tasted good but not great. Salsas, pickled red onions, and jalapeños from the serve-yourself condiment bar all provided the heat. No one in my party wanted to take more than one bite of the pastrami dip sandwich. Although it contained a mountain of meat, its flavor had apparently vanished into thin air. A meager peep of mustard and pickle could not save it, and the au jus dipping sauce seemed more like lukewarm beef broth. We chowed down on the shoestring French fries but recoiled at the chili, a meat-poor mush that might as well have been served out of a can. Every piece of fried fish started with a bite of pure batter and ended with a limp mass of meat. I was disappointed to learn that some of the specialty sodas on the online menu were not available in Southlake. No piña colada, orange bang, or Jamaica for me. No milkshakes, either, so my raging sweet tooth had to be placated with a “suicide” mix of fountain drinks. At least my burger cravings were 100-percent satisfied. Despite its shortcomings, Everest is worth the drive to Southlake for burger lovers in search of adventure — no headlamp needed.